The much anticipated and often rumored Nexus 10 is official, and it sounds like serious competition for Apple: A stunning screen that outdoes the iPad's Retina resolution, an attractive design, and some truly beefed up specs. This is a device that doesn't hold back, and the entire package is wrapped up neatly in one seriously great price: $400 for the base 16GB model. As expected, Google partnered with Samsung (fitting, no?) to get this beast off the ground. Just as the Nexus 7 did, this device has the potential to alter and sway the marketplace due to its huge value — $100 cheaper than the iPad — and tremendously attractive specs. This is like the latest luxury concept vehicle, but it's real: 1.7GHz Samsung Exynos processor, 2GB of RAM, 5-megapixel camera, and a 2560×1600 display that bests the iPad's Retina — 300 ppi compared to 264 ppi. Additionally, it outdoes the Kindle Fire HD's display, which comes in at 1920×1200. Google is calling this both powerful and shareable, meaning big families can easily get their own unique experience with the device. Thanks to Android 4.2 (learn more here), owners can add multiple users and instantly switch between Mom, Dad, Uncle Hank and Little Suzy on the lockscreen. "We believe that everyone should have quick and easy access to their own stuff — email, apps, bookmarks, and more," Google's Andy Rubin, SVP, Mobile and Digital Content said on Monday. "That way, everyone can have their own home screens, their own music, and even their own high scores." It's a small idea that can make a huge impact, and something that has been overlooked on tablets for far too long. But won't battery life take a hit with multiple users handling the Nexus 10? Not if it lives up to Google's advertised 10 hours. We'll have to reserve judgement on Google's claims and see just how long the tab lasts when switching users, watching video, listening to music, etc., but 10 hours should be plenty for a day of intermittent use. The Nexus 10, as we said, sounds like a pretty fantastic value for $400, undercutting the iPad by a full $100 heading into the holiday season. Will it impact Apple's sales? It's hard to say. But there's no ignoring Google's gadget-making credentials. 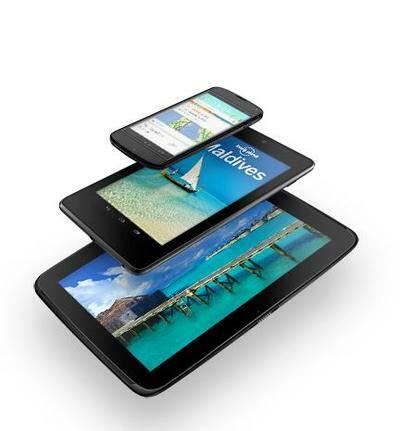 The company has carved out a pretty impressive lineup of devices — Nexus 4, Nexus 7 — and now, the Nexus 10. The bigger tab will be available through Google Play (U.S., U.K., Australia, France, Germany, Spain and Canada) starting Nov. 13, and go for $399 for the 16GB version, and $499 for the 32GB version.